According to research, one of the habits of truly happy people is to be grateful -- to count your blessings, you might say. We've been trying to do that in our home. But this post is a bit more literal. In the church in which Jeff and I were raised, when babies are born they typically receive a special blessing. Often the baby receives this blessing from his/her biological or adoptive father, but not always. Only a few of the words are preset, so the blessing-giver can ask God to bless the baby with whatever he feels strongly is appropriate for that child. A father might bless the baby with special promises or instructions about life - family, friends, education, faith, hard choices, honest work, health, being or following a good example, etc. Some blessings are long; some are quite short. The babies are dressed in white. 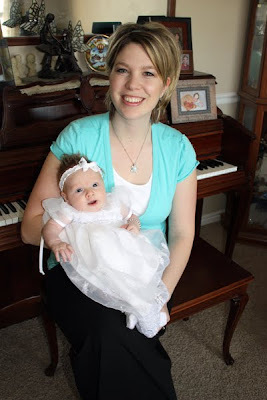 The blessing is usually done at church, in a public setting, but some parents choose to bless their child at home in a more private environment. Many families have a tradition of holding a luncheon or small gathering to celebrate the occasion, but this is not expected. Last Sunday, Jeff's twin brother, Jeremy, gave such a blessing to his new daughter, Sienna. Sienna looked so precious in her little white dress, just hanging out seemingly as content as could be. Here she is pictured below with her beautiful mom, Heidi. 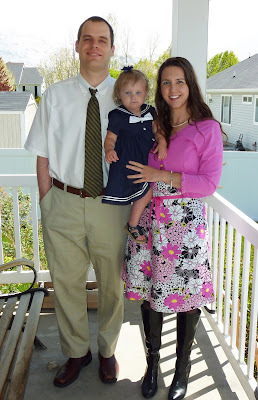 Heidi & Jeremy invited the family to their home at noon, an hour before their church service started. I was so glad they did because Jeff and I had to make our own choice about attending. Of all the odds, my dear friend Ann-Marie who had identical triplets back in September decided her girls were strong & healthy enough to bring them out in public for the first time for their baby blessings... on the same day... at the same hour as Sienna's blessing! So, when it comes to blessings, last Sunday we got to count four! We decided, as painful as it was to choose, to attend the family gathering with Sienna at lunchtime and then for me to split off to attend the triplets' blessings. Jeff and Bridgette stayed to be a part of their niece/cousin's big day. 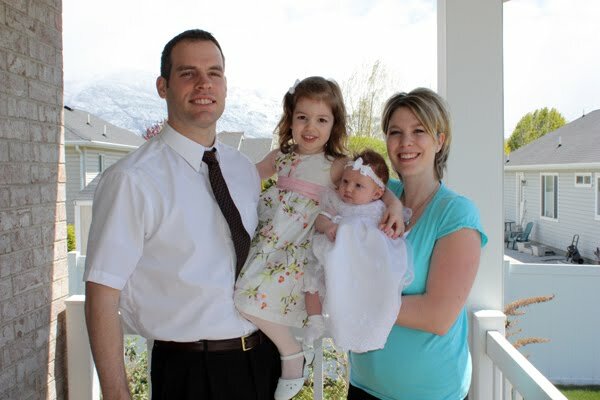 This photo was taken on their porch before church and shows Jeremy, Heidi, Sienna, and their first daughter, Ellie, who loves her baby sister very much. Ann-Marie's husband Anthony blessed his daughters. It was interesting to hear the similarities but also the differences in each of the girls' blessings. We then adjourned to their home for a luncheon. It was a full and exciting day. This is gorgeous Ann-Marie with her three stunning daughters: Ruthie, Annie, and Gracie. I have no idea which one is which. Ann-Marie could tell you though -- she's found a couple of unique features to distinguish them. But I'm telling you, they are mighty identical. 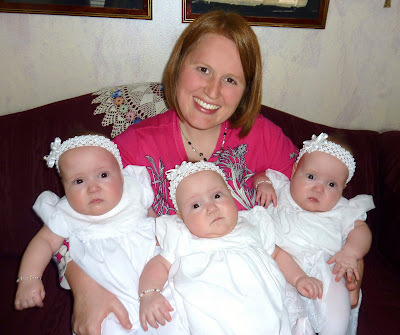 You can read more about their amazing story at Bott Family Triplets. I was so excited to be able to hold them, though I'm not so sure they felt the same way! Holding them for a few seconds confirmed my belief that Ann-Marie is wonder woman. Most of us can only imagine what another person is experiencing in life. When it comes to the Bott family... I can't even come close to imagining the change of pace & lifestyle associated with triplets. I mean, seriously, I didn't have enough arms to hold them properly. One was balanced precariously on my lap. How do parents of triplets survive? Ann-Marie might say that she barely does, but secretly, I think she has super-powers. That brings me back to gratitude, I guess. Once again, as I do so often, I thought a lot about how thankful I am for Bridgette. Talk about a precious little life. She's been through more in 22 months than many people do in a lifetime. She's progressed a lot, especially in the last month... the first time in her life she's felt well for a month straight. I'm so glad we have had medical and therapeutic help from professionals as well as support and love from family & friends. Most of all, I'm so grateful she simply is. I'm excited to see what she will choose to do, be, and become over the years. Look at her! She's growing up! And Bridgette is grateful for her cousin Ellie. They're already pretty good friends and take turns copying the other's actions or following each other around. This is the musical marvel of Ellie singing her favorite song, ABBA's Mama Mia, accompanied in part by Bridgette. That post made me happy! how can you not smile with so many cute babies around ? love it! Thank YOU for this post! I feel good after reading it and watching the musical performance. You look beautiful in the picture with the triplets! What a happy post! The pictures of both Ann-Marie and you holding the triplets made me tear up! It's been awhile since she updated her blog and the girls are big now! I seriously don't know how mothers of multiples survive either! I love your beautiful outfit! You look gorgeous! I need to get to posting about our baby's blessing! Kelly - What a small world! I teach 2nd grade with the triplet's aunt, Carissa Bott Briggs! I totally know their story and names from talking to her at work. She's awesome and is expecting her first baby this summer. How do you know Ann-Marie?